Ian Thomas: Physical. Fast. Ready. 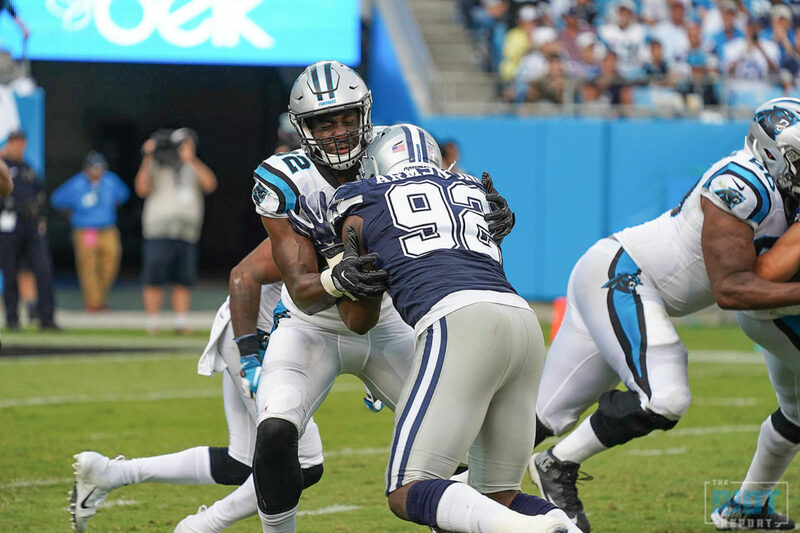 Greg Olsen has consistently given the same advice to Chris Manhertz and Ian Thomas as the 33-year old three-time Pro Bowler tries to mentor the two young tight ends who between the two of them have five career receptions compared to Olsen’s 641. Play physical. Play fast. Be ready. 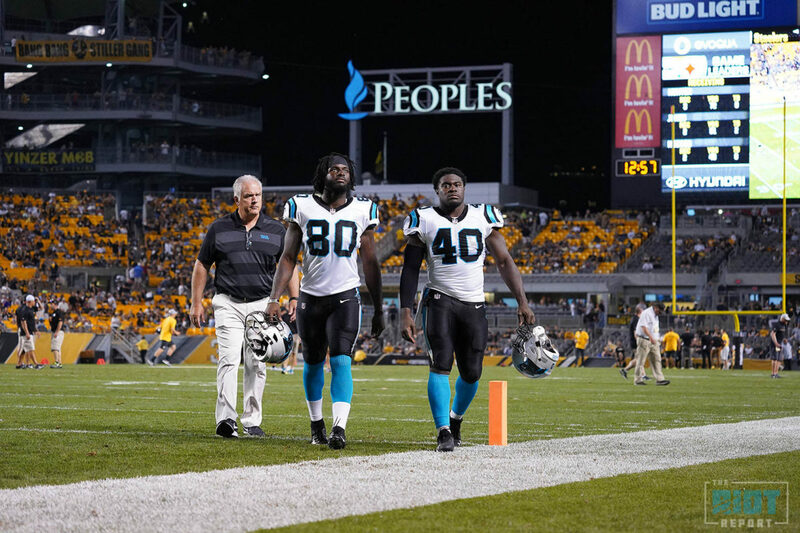 The readiness of Thomas and Olsen is going to have to be accelerated after Olsen suffered a re-break of the right foot that cost him nine games in the 2017 season – Olsen isn’t expected to go on injured reserve and will rehab the injury with the expectation that he will return sometime during the 2018 season, perhaps to help the team in late season and into the playoffs as he did last year – but for Week 2 in Atlanta and the forseeable future, the Panthers will lean on Chris Manhertz, who has three career receptions and is thought of more as a blocker than a pass catcher, and rookie Ian Thomas, who will likely see the bulk of the tight end targets, just as Ed Dickson did when Olsen missed time in 2017; they can also use Alex Armah as an inline tight end – last year’s sixth-rounder has practiced with that group for most of the offseason. 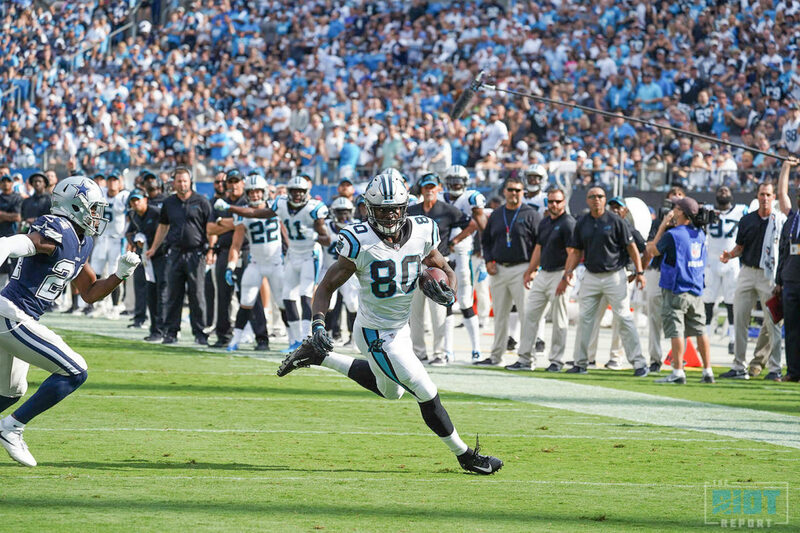 With Olsen on the shelf, Dickson picked up 23 receptions over eight games – a far cry from Olsen’s 4.3 receptions per game during his eight seasons in Carolina. Thomas, who only played two seasons of football at Indiana before declaring for the Draft and being selected by the Panthers with the first pick of the fourth round, thought that he played decently in the opener, but there’s still things to improve on – Head Coach Ron Rivera said that he felt as if Thomas was good at blocking, route running and receiving, but he had three areas where he can improve his game. Blocking, route running, and receiving. No matter how good you are, there’s always room to improve – especially when you’re a rookie who’s about to get thrown feet first into the fire. One thing that Thomas feels as if he has shown marked improvement upon since he arrived in the NFL has been blocking – teams told him in the lead up to the NFL Draft that he wasn’t good at the dirty work involved in being a tight end; blocking is such a huge part of being a tight end in the Carolina Panthers offensive scheme and that will be even more key with right tackle Daryl Williams being placed on IR as he undergoes knee surgery. Chris Manhertz, who is entering his third year with the team and fourth in the NFL after being converted from a college basketball player – the 26-year old hadn’t played a snap of competitive football in his entire life before being invited to Buffalo Bills offseason workouts ahead of the 2014 season – says that both he and Thomas are ready to step in where Olsen left off – comparisons to one of the best tight ends in the league aren’t exactly fair, but the tight end room prepares for situations like this. How ready they’ll be this Sunday against a Falcons defense that just placed two Pro Bowlers – safety Keanu Neal and linebacker Deion Jones – on injured reserve will be hugely important for a Panthers offense that only completed seven passes to wide receivers during their season opener – Olsen, who missed the final three quarters, had 20% of the team’s total receiving yards. Ian Thomas is set to become another in a long line of rookies that have had an impact for the Panthers – Ron Rivera has started a rookie in every season opener since becoming the Panthers’ coach in 2011; but Thomas has been preparing for this opportunity since the spring. The most important piece of advice – be ready. Josh Klein is Managing Editor of The Riot Report. His favorite Panther of all time is Chad Cota and he once AIM chatted with Kevin Greene. Follow Josh on Twitter @joshkleinrules.